Posted on August 9, 2011 January 26, 2019 by SherylPosted in StatisticsTagged 1911, 2011, life expectancy. Fascinating on so many levels. I love Helena’s introspection and your extrapolation of it to life expectancy. 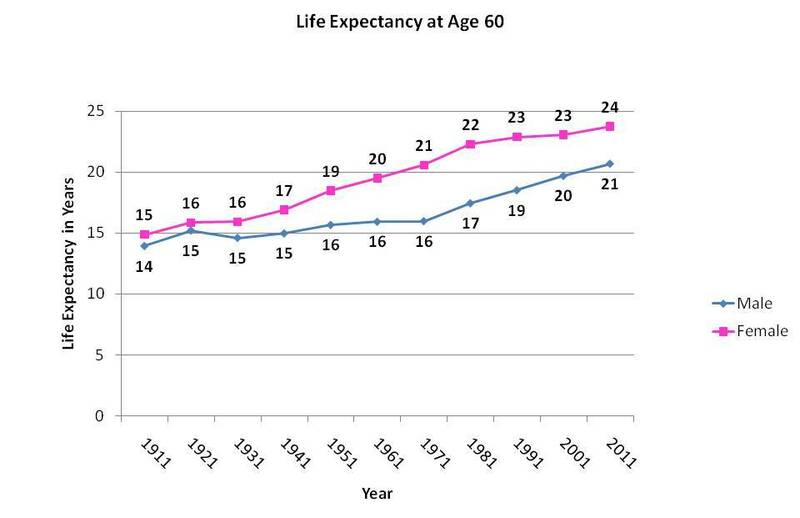 The male life expectancy chart at age 60 is curious. What changed in the late 60s to improve the rates? Was it the push to make people aware of the dangers of smoking or was there some medical breakthrough? I’m not sure why the life expectancy at age 60 improved in the 1960s–but your suggestion makes sense to me that maybe it was because people became more aware of the dangers of smoking. I did a quick Google search and increases in life expectancy seem to be generally attributed to public health initiatives, medical breakthroughs, and improved nutrition. I suspect that the increase in life expectancy after the 1940s is related to the availability of antibiotics. Thanks for the taking the time to add this comment. I’d never thought about antibiotics, but it makes perfect sense. Excellent graphs that I can use when I explain that the US Census’ 72 year privacy rule has nothing to do with life expectancy in my Family History Research class! It’s wonderful to hear that you found this useful. Like the earlier commenter, I wanted to add other things that may have had a hand in the life expectancies 100 years ago: the types of work a person does, for one. There were some very dangerous working environments and no safety regulation. I found this out when I worked the graveyard shift in a 100+yr old funeral home in downtown Los Angeles: I would go up to the records room and read the death and funeral records for the early 1900s while on my lunch break. You’d be amazed at the horse and buggy accidents, railcar coupling fatalities, and tramplings…also, the elevator mishaps and misadventures eating poisonous toadstools in the forests near present-day Santa Monica. In 1918, I noticed that the Spanish Influenza seemed to hit 18-30 yr-olds hardest and resulted in large death tolls around the world. Tuberculosis was common here too as everyone came West to the drier climate to convalesce. Modern transport and safer working conditions and vaccines keep us from ever realizing the hard lives of 100 years ago, I am certain. 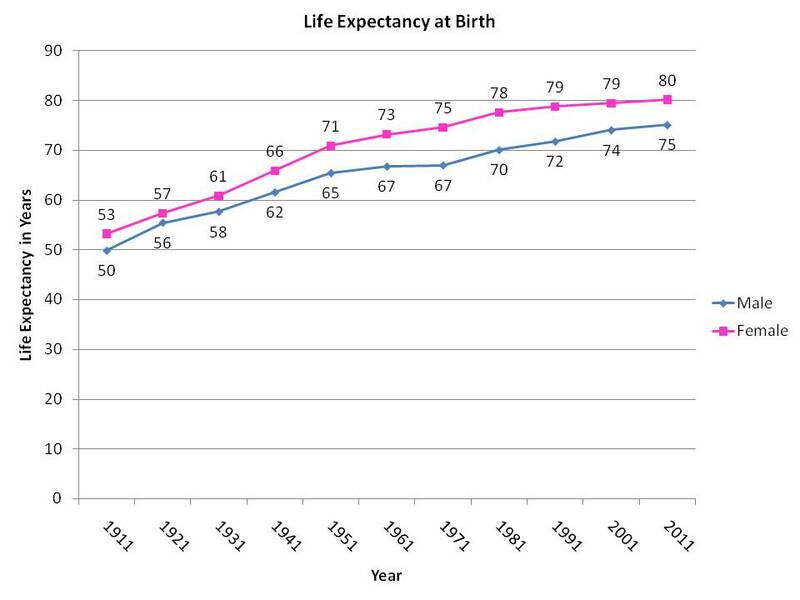 People are living longer…but many after age 80 are not doing that well…. Even a hundred years ago, a few people lived to be very elderly. I’ve often wondered about the health of those people in their later years. my aunt was head nurse in a Los Angeles area hospital until age 95.
willing… 94. Tomorrow, my former airline business associate, Dave McCoy,who founded Mammoth Mt. Ski area will be 100, his wife Roma is 95. A great guy…in every way. I suppose, for people born between 1910 and 1930, life expectancy was shortened by wars. It’s also so that many people lived very long lives once they were past the middle age. It’s probably different in countries like USA and Canada, but Europe certainly suffered from shorter life spans due to revolutions and 2 World wars. Anyway, it was very interesting to compare. The large number of people taking yoga, aerobics, Pilates, and dance of all kinds probably has an effect on health, too. I enjoyed reading all these comments. Thanks. That’s a good point. Exercise and other components of an active lifestyle can have such a positive effect on health. No doubt that’s true, but a large number of people get no more exercise today than going to the break room for a donut. There’s a great older essay on modern life and exercise (amongst other things) if a person can find it. It’s Henry Fairlie’s “The Cow’s Revenge”, which was published in The New Republic a couple of decades back. At least at one time, you could find some of it on line. We hear the statistics so often, but we rarely stop to consider the full dimensions of what they mean.